Just a reminder that this game will take place tomorrow at Bellsdale park with a 2pm kick off . There will also be souvenir programmes for sale on the day for anyone wishing to purchase any. Anyone at a loose end tomorrow will be made most welcome at Bellsdale park for our first pre-season game . Cheers JC and looking forward to the real stuff starting again rather than that world cup diving nonsense. Cheers JC and I will pass on your message to john that you are asking for him. just having a wee look back - it's 10 years ago this month since we signed you big fella. Happy anniversary lol. For god sake Jon you after a move already! Ach diddy game so it is playing that lot! ! Only messing before anyone takes a funny turn, hope it's a good day for the beef. holy f**k is it that long ago really? Lol scary! Aye. You get a testimonial for being at a club for 10 years. No many boys do one a year for 10 years though! For anyone interested, Beith won 4-1 after being 1 down and Adam Strain pulling off some great saves in the first half. Goals from Kenny McLean, Darren Christie (2), Andy Reid. Programmes left if anyone would like to buy one? Up to the first team and he took his goal really well. Beith took a while to settle into the game but took their goals brilliantly (the new number 10 who scored twice looks to be a great addition to the squad). Adam Strain had a few great saves too to keep the Gers out, overall I thought it was a great game and glad I went. Can only echo all you are saying and it was a really nice atmosphere with absolutely no bigotry on show and only people wishing for a good game. Beith couldn't really get on the ball for the first twenty minutes and our keeper Adam strain was inspirational with 6 very good saves. However shortly After this we scored an equaliser to make it 1-1 and never looked back to be honest. 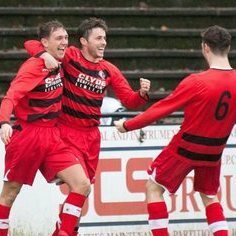 Special mention to our two new signings who were very good for me and wee joe Bradley was amazing in winning the man of the match. A big thanks to rangers for coming down and it was a good game. what kind of turnout was there ? Nice to see the Beith fans behaving themselves for a change. I'm not too sure bill as it was a horrible day for it and I think that put lots of people off going. I would guess between 200 and 300.